I've made no secret of my recent obsession with Pinterest.....there is no doubt it has helped me heaps in my recent budget challenge! It's certainly made me look over my wardrobe with a fresh set of eyes and it has helped to re-ignite my passion with some of my old faithfuls and favourites! So over these past few days I've been putting together a few ensembles which are loosely based on some of the outfits that I've pinned! These are my interpretations as I haven't been able to completely copy! It is fun pulling things together which you may not have thought about putting together and getting wear out of some items you may have overlooked or forgotten about! I recommend that you go forth and play! Here is my first attempt. As you will probably have gathered I am loving a shirt and sweater combo at the moment! I love this look but have previously struggled to work mixing the stripe and check look.....it's so out of my comfort zone! But hey.....now's it's another one of those clothing fears I have overcome like I did with the double denim a couple of posts back! Here's the complete look adapted for the school run! Here I'm wearing Topshop Parka, Uniqlo shirt, H&M Breton, Zara Jeans, Converse hi-tops and Mulberry Seth bag. This is a DKNY leather biker jacket with, H&M stripe top, Topshop Baxters and H&M pumps. Although I did actually end up wearing it like this purely as it was a tad more conducive to the weather! 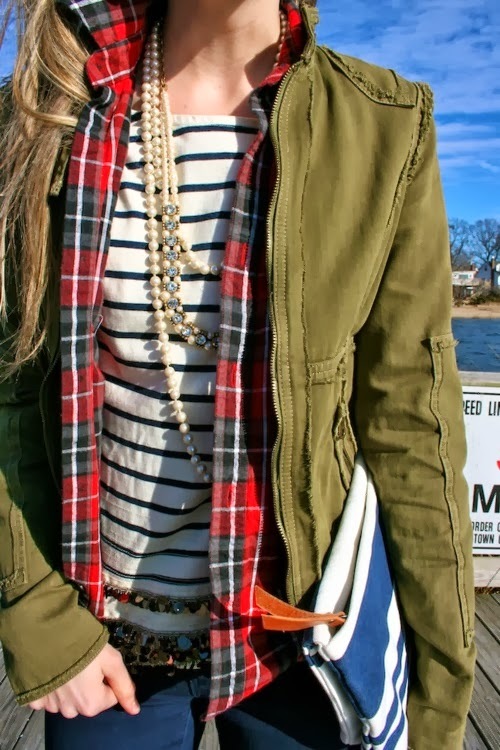 This version is Whistles biker jacket, H&M top, Topshop Baxter jeans, H&M pumps and Oasis scarf. So now you can see the inspiration for some of my recent purchases! I have spent a fair few hours pouring over the looks getting ideas. If you would like to peruse my pins you can do so here. Are you feeling the Pinterest love? Does it give you lots of inspiration? Does it tempt you or help you put looks together? Has it motivated any new purchases you have made? Would love to hear how you use it! I'm on a budget and I've managed to acquire 3 jackets this month and not a single sweater bearing in mind that's what I set out to buy at the beginning of my challenge! I may not have been sticking to the original plan but I think I've ended up with a better strategy!! All the challenge items I've purchased do go so perfectly with what I have that I see them all as being brilliant investments! Oh and let's be fair it's not really been cold enough to warrant buying sweaters just yet........but I am sure I will be panic buying some jumpers soon! In store the blazer is reduced to £34.99 and lucky for me the day I visited the store there was a further 20% off thanks to being on the Gap VIP mailing list.......so if you haven't already done so sign up!! You don't want to miss further discounts especially as there is a further 20% off on Saturday 19th and Sunday 20th October! I must point out that for some reason on their website the jacket is still full price at £54.95......strange! In any case I totally bagged myself another bargain as I paid just £27.99! Still leaving me £23 in my budget for October! This spotty one is reduced to £34.99 so with the further 20% down to £27.99, a good buy what with spots being the new stripes this season. They have even catered for the die-hard stripe fan! Even more of a bargain at £26.41 with the discount! And of course there is good old monochrome! 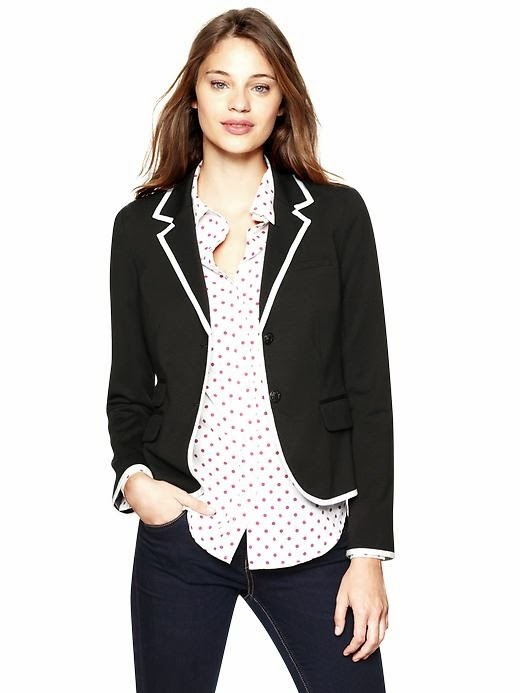 Classic black blazer with white trim. This one works out at £29.61 with the discount! 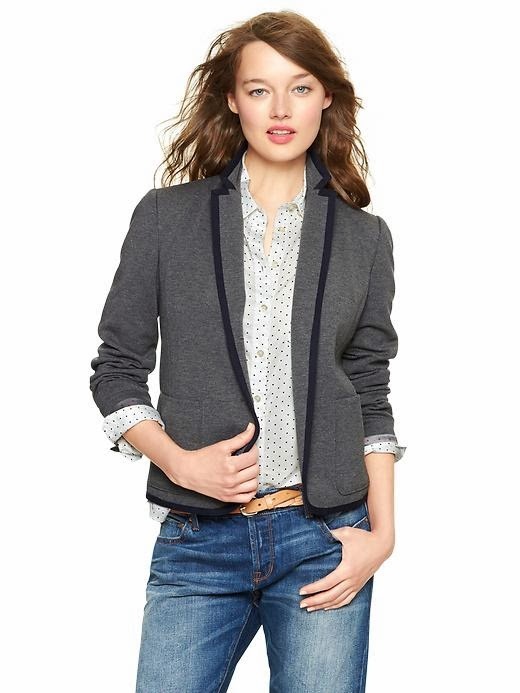 Some great blazers to be had from Gap and all for under 30 quid.........shame there is not room in the budget for at least one more for me! Here's how I'm wearing mine today! No purchases to divulge to today.....just fessin' up to stealing style! Oh to the joy of being able to cobble an outfit together without spending a penny!! This is something I would never have envisaged putting together....it's double denim for a start, which is a look I've really struggled with! I've just recently fallen in love with layering a shirt and sweater so when I saw this shot of Olivia Palermo, well I thought I'd give it a whirl......and I am pretty pleased the results!! When the husband says 'you look nice' you know you must be onto a good thing! Here I've added H&M coat as the temperatures are certainly dipping! So what do you think? How have I done? I think I could really smash my challenge if I could throw a few more looks together like this where I have found similar items in my wardrobe! I've had more fun and more of a buzz putting this together than I have acquiring anything new this week!! I love getting inspiration.....it comes from everywhere! Where do you get you inspiration? For those of you who have been on this blogging journey with me from the start you may remember that one of the items on my Autumn/Winter wishlist wayback on my first post was a black blazer. 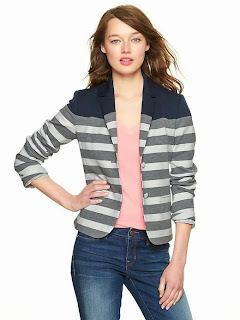 I did feature a Zara blazer which I had had my eye on for a few months. I never did get around to buying it because I just couldn't justify the price for something that I wasn't sure that I'd get the wear out of, which could in part could also be due to the fact I have an alarming amount of jackets already! That coupled with an unreasonable fear that a black blazer would also feel a bit 'work' like even though in my job I would never wear a blazer as it just doesn't fit in with what I do....it'd be way too smart! Anyway I've bought and taken back a few jackets as they have just not been quite right. After stalking other peoples style on Pinterest I've realised that there are quite a few items in my wardrobe that are crying out to be worn with a blazer and I can see that I could make up many of the looks I love if I could just find that one elusive article!! 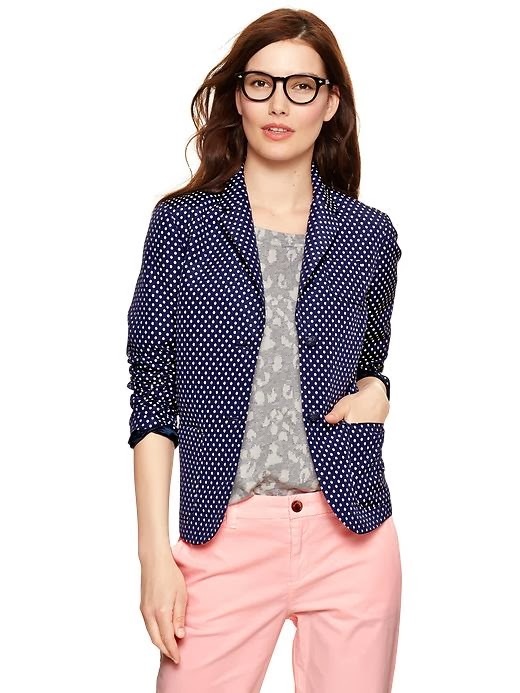 As luck would have it I have stumbled upon my ideal jacket whilst perusing around Mango looking for something entirely different! This is one piece could really have blown the entire £100 budget but the best part about it was that it was reduced in the mid season sale to £34.99!! What a result! Probably best to put aside the fact that I am almost at the half way through the budget and I am only a week into the challenge! On the upside I have made 2 great purchases that will be wardrobe staples. Chuffed to pieces would be an understatement! I love the fact that the hardware is silver, it has a little velvet collar too. I didn't think I'd go for double breasted having tried a few on but I think as this one is on the shorter side length wise, the proportions are better for my shape. I've styled it up here for lunching with the ladies! I've no doubt this is a jacket you will see me flogging again and again now that I've found 'the one'! Going back to the first purchase that kicked off my challenge.....the French Connection red and white Breton style top arrived and is a complete success! I must credit the French Connection outlet on eBay. The customer service was absolutely fantastic and delivery was super swift.....what more can a girl ask for?! It's fair to say that I'm really pleased with how I'm doing with the challenge so far. It pays to have a proper plan which I do feel that I have now with the help of tools like Pinterest! I'm full of ideas of how to really utilise and update what I already have! It's really made my mind tick and actually the whole shopping experience much more enjoyable. Do you think I have spent wisely so far? Anyway onto the array of outfits I've been wearing over the past week. And we're off! The 1st October has been and almost gone and so how have I done on the first day of my challenge? Have I bought anything? Hell yes.....but more about that later! Do I think the challenge is do-able.....yes indeedy I do! I must admit that I got paid last Friday and so immediately went shopping (this is the only way to celebrate payday and Friday....yay!). Off I headed to House of Fraser (20% off brand event!!) Zara and H&M. Bet you are dying to know how I fared??!! Sorry but I came home with zilch!! Nada! But my head was frazzled with all the ways in which I could spend 100 quid. I went out looking for sweaters and there were plenty of lovely knits around but not one that would have me part with my hard earned cash there and then! I did go home buzzing with ideas about getting this and that but I have to admit that the following day......everything was all but forgotten and Friday's wishlist was scrapped! Prey tell, I hear you ask? Did I need any of it? Did I love any of it? No. Not nearly enough. However (you know you can always count on one of them!) it did make me start really thinking about items that would really work with what I have. In truth I did get a fair bit of inspiration from my normal stomping ground Avenue 57 and so came up with the idea for this first purchase. Not that I don't already own enough stripes.....out of the last 4 days, 3 days I have worn stripes but they are all navy/white or navy and cream combo....with a bit of black and grey to mix things up a bit!! So I had my head turned by this. I had seen someone wearing something similar to this and just knew I had to have one! Admittedly not an item to set the world alight but definitely one that would bring some wardrobe joy for me! 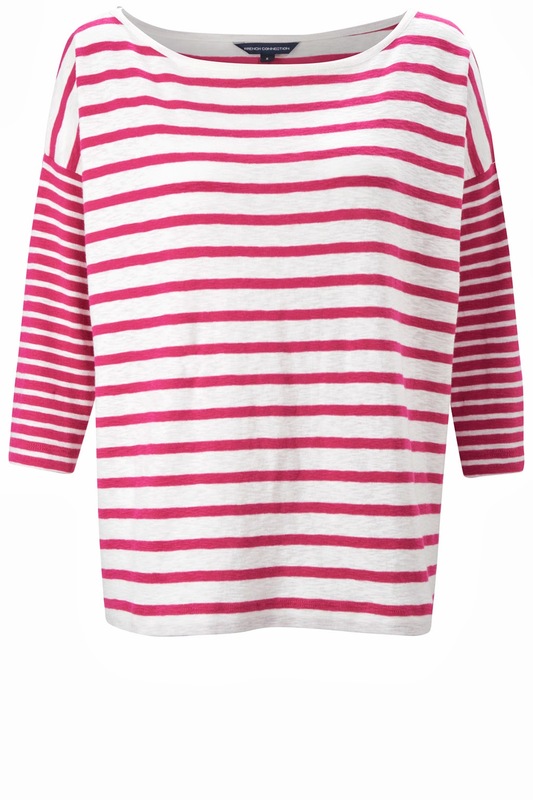 Who would believe that it would be so hard to find such a basic item as a red & white breton?? Gosh did I trawl......for hours and absolutely everywhere I could think of!! 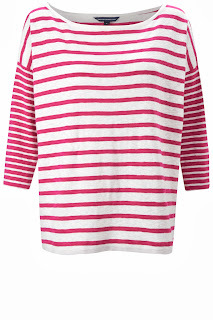 When I did manage to find what I wanted....a 'Captain Corsaire' Alexa Chung style-y Breton on eBay I was outbid....boo-hoo! But that lead me down a path! 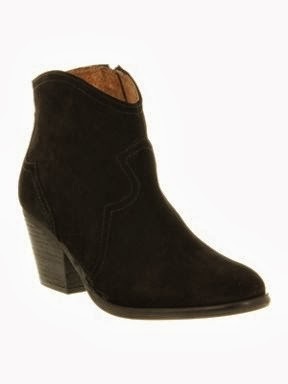 I remembered the lovely Andrea's of Cous Cous & Cork Wedges post a couple of weeks back about the eBay Boden outlet so I checked there.....but to no avail :0( Then I turned my attention to the French Connection outlet......low and behold success at last!! The above little beauty is on sale for just £9.40 and 99p for postage......hallelujah! So what will be next? What other items have I identified that are missing from my wardrobe??? You will just have to wait and see??!! I have to say that I now have some proper planning in place thanks to the gorgeous Jo Sidley aka @FashionPassion on A57 as she unwittingly re-ignited my interest in Pinterest!! My Husband may have lost me forever as I am now scheming away about my next purchase.....let's just say there are more than a few ideas rolling around now (all secret at the moment of course)!! So onto the looks I've been displaying these past few days! A day of appointments and airport runs!